We are deeply saddened to announce the passing of Malcolm Ruddick after a lengthy and courageous battle with cancer. Malcolm was born in Mission BC on May 26, 1953 and passed away at Kamloops Hospice surrounded by family on January 10, 2017. Malcolm is survived by his loving wife Kathy Ruddick (nee Turner) and her mother Edna Snider, his brother Ken Ruddick (Ruth) of Nanaimo BC, his sister Cheryle Macdonald (John) of Stave Falls, sister Karyn Ruddick of Vancouver, sister Heather Anderson of Bellingham, WA. Nieces Jennifer Armour (Stuart), Beth Kennard (Jason), Coral Anderson, Evan Gregory (Gavin), Kristina Ruddick, and nephew Jamie Ruddick. Malcolm was pre-deceased by his father Ken Ruddick and mother Vera Ruddick of Stave Falls BC. Malcolm grew up in Stave Falls, a small community between Maple Ridge and Mission, B.C. He attended a small one room elementary school that housed grades from 1 to 7, and then attended Mission High School. 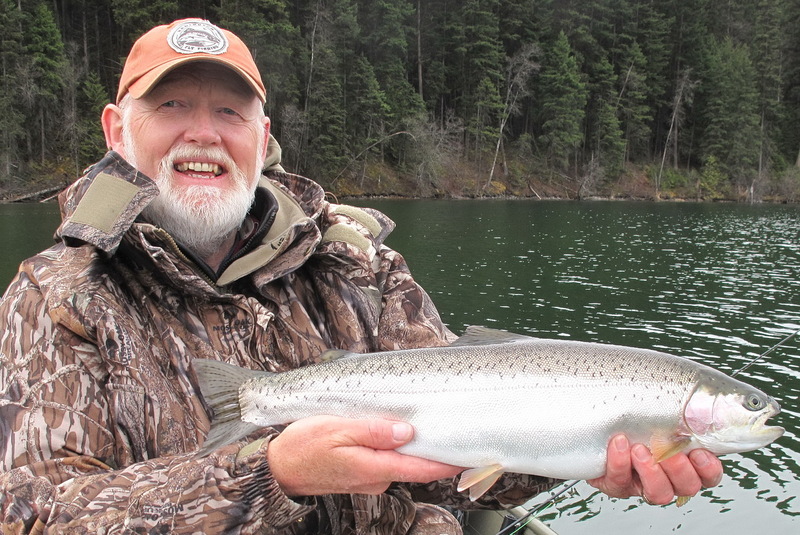 Growing up a rural location enhanced his love of the outdoors, fishing Stave Lake and Rivers when he was young. His passion for fishing was rooted in those early years and continued his entire life. Malcolm and his father Ken started Ruddick’s Fly shop in 1972 out of a garage and then a barn on his father’s property in Stave Falls BC. Malcolm took it to the next level in 1976 moving the shop to a full retail location in Maple Ridge. In 1978 Malcolm and Kathy were married and later that year moved the store to Burnaby/ Vancouver locations. Ruddick’s Fly shop was a pioneer in the industry being the first retail specialty Fly Shop west of Toronto, directly sourcing and importing supplies and materials for the fly angler and fly tier. Malcolm and Kathy owned and operated the store together, and Ruddick’s expanded into two locations and became a true destination not only for locals but also international anglers from Japan, Europe and Britain. The location in Burnaby became a regular meeting place, especially on Saturday mornings for enthusiastic fly fisherman to share a coffee and swap stories. Granville Island became the second location at a later date. The stores further expanded into fly fishing/tying education, hosting fly fishing destination trips as well as radio and television shows. Malcolm was an accomplished fisherman starting at the age of 10 but his love for fly fishing and fly tying became his passion. He was an expert fly tier and became famous for his exquisite and innovative fly patterns, in particular his polar bear coho, salmon/steelhead and trout flies. Malcolm had a deep love and respect for animals, especially dogs. Once again a maverick, Malcolm acquired Nova Scotia Duck Tollers directly from Nova Scotia and started to raise them in the early 1980’s. Malcolm and Kathy hunted and fished with them extensively long before it was vogue to own one. Later, Malcolm became involved in training both Tollers and Labs for field trials as well as becoming a Trial Judge. He worked with his beloved dogs attending trials throughout BC and Alberta where he won numerous awards. After moving to Kamloops in 2007 Malcolm assisted in the opening and managing of Wholesale Sports, sharing his expertise in retail and industry. He left Wholesale Sports in 2011 after his illness no longer allowed him to work. A Celebration of Life will be held in the spring as per Malcolm’s wishes, further details to follow. It will be a comfortable and casual gathering, hopefully lakeside close to Kamloops in early May. In lieu of flowers, we ask that you donate in Malcolm’s name to Kamloops Hospice or Charity of your choice. There will also be a plan to donate to a “fishing” enhancement project in the Kamloops region with details determined and confirmed closer to the Celebration of Life.